This painting shows more than the portrait of a gentleman. 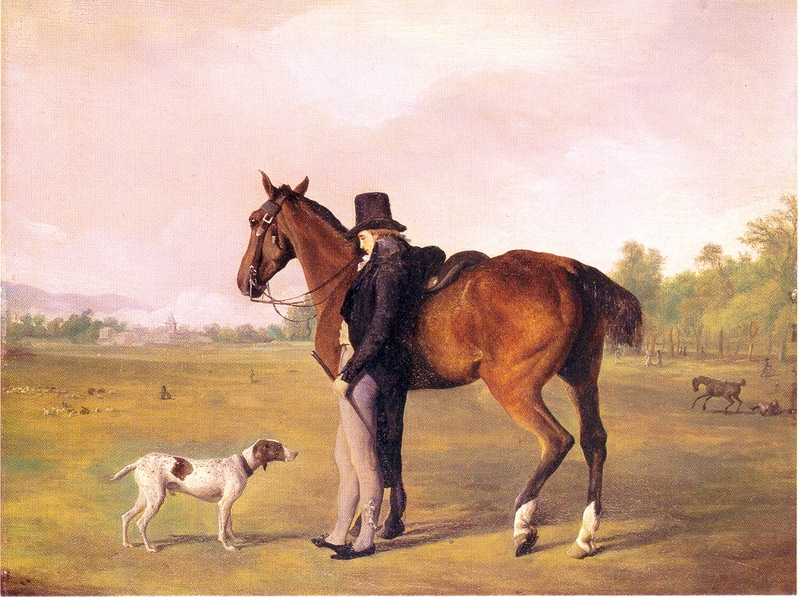 Mr. Audéoud-Fazy’ s face is hardly visible, but the viewer’ s eye is at first attracted by the horse and the hound. The horse is not an impressive thoroughbred or hunter as one may expect. but rather an ugly strong animal. Yet this is the horse the rider has chosen for the combined portrait. So we can conclude that this horse had all the qualities his rider wanted. He apparently did not care about handsomeness. The hound, a pointer, shows his obedience while his master talks to him and the horse just waits for instructions. It is a pity the name of the horse and the hound have not been recorded in the archives. The three must have had many fine hours in the field. Mr. Audéoud-Fazy was a member of the Council of Plainpalais (borough of Geneva). In this painting he was about 30 yers old.